Animal campaigns charity OneKind has released a new report, The welfare status of salmon farms and companies in Scotland, which highlights the worst and best salmon farms for animal welfare in Scotland in 2017. The report collates publicly available data on mortalities, escapes, biomass exceedance, seal shooting and sea lice burdens for the 184 active salmon farms operating in Scotland in 2017 and allocates “negative welfare” scores for each category, with higher scores indicating poorer standards within these categories. 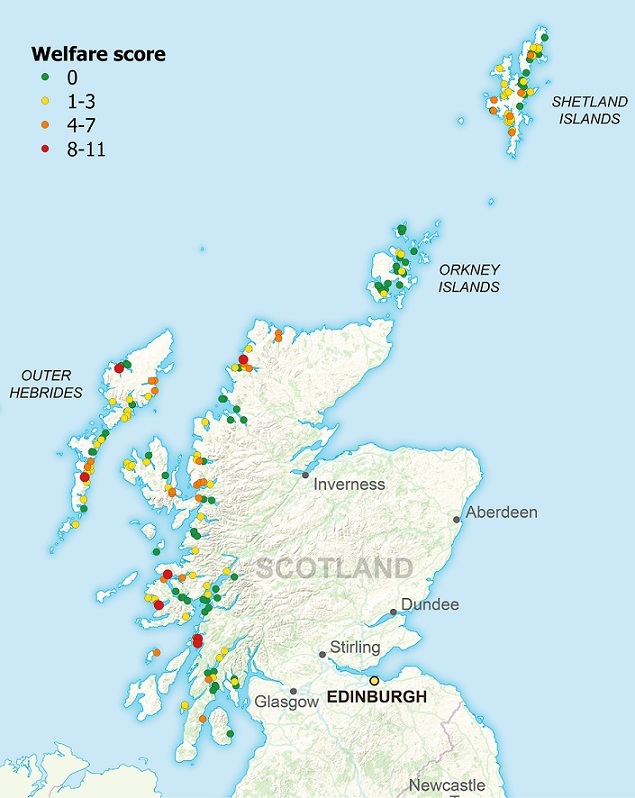 The highest scoring farms in the report were named as Poll na Gille in Argyll and Bute, MacLean’s Nose in the Highlands, Bagh dail nan Cean in Argyll and Bute, all of which are Marine Harvest farms, and Vuia Beag in Eilean Siar which is owned by the Scottish Salmon Company. The report also looked at the performance of companies and allocated Loch Duart Ltd, which has 10 seawater salmon farms in Scotland, the highest average “negative welfare” score in the areas studied, with Marine Harvest in second place and The Scottish Salmon Company in third. “This is the first time that the animal welfare performance of Scotland’s salmon farms and salmon farming companies has been ranked, and it reveals an enormous gap between the best farms and the worst offenders. Scotland is the largest producer of farmed Atlantic salmon in the EU, yet it’s estimated that over 11 million individual salmon died prematurely on Scottish farms in 2017. OneKind’s report also shows that 26 salmon farms shot at least one seal in 2017 with a total of 49 seals shot. The farm that shot the most seals was Loch Carnan (Loch Duart Ltd) which shot 9 animals. Poll na Gille (Marine Harvest) in Argyll and Bute was also highlighted for breaching biomass limits set by the Scottish Environment Protection Agency (SEPA) six times in 2017, sometimes by up to 50%. This meant that they significantly overstocked their fish cages, seriously compromising welfare. Wester Ross Fisheries is by far the standout company in 2017 for animal welfare. Across all three sites operating in 2017, there were no incidents of escapes, high sea lice burdens , seal shooting, incidents of exceeding biomass limits or monthly mortality rates of ≥ 10%. Of the five larger companies, Cooke Aquaculture, stood out, with an average “negative welfare” score less than half those of Marine Harvest and Loch Duart Ltd.
“Our report shows that there is a significant range in performance between the best and worst companies, and that it is therefore possible for salmon farms to operate without serious animal welfare breaches.